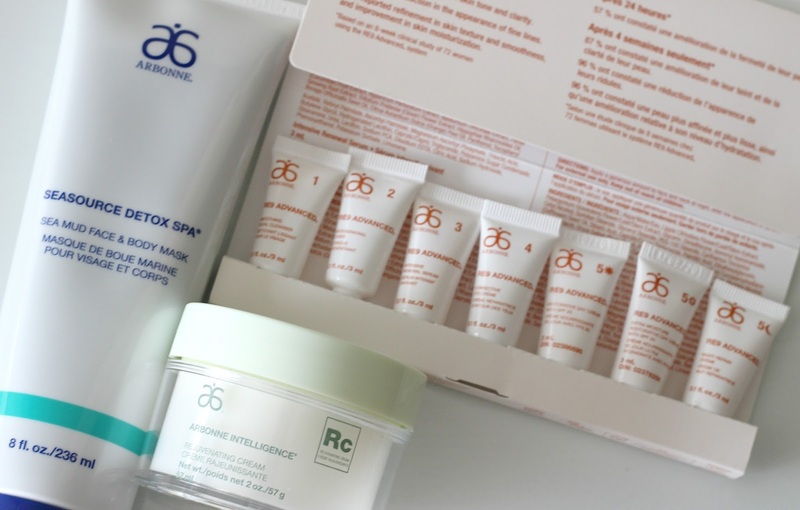 Arbonne is one of those brands that has peeked my curiosity for many years. I am now familiar with a few of their lip products, having previously share their Smoothed Over Lipsticks and also a shade each of their Glossed Over Lip Gloss and Lip Liner. 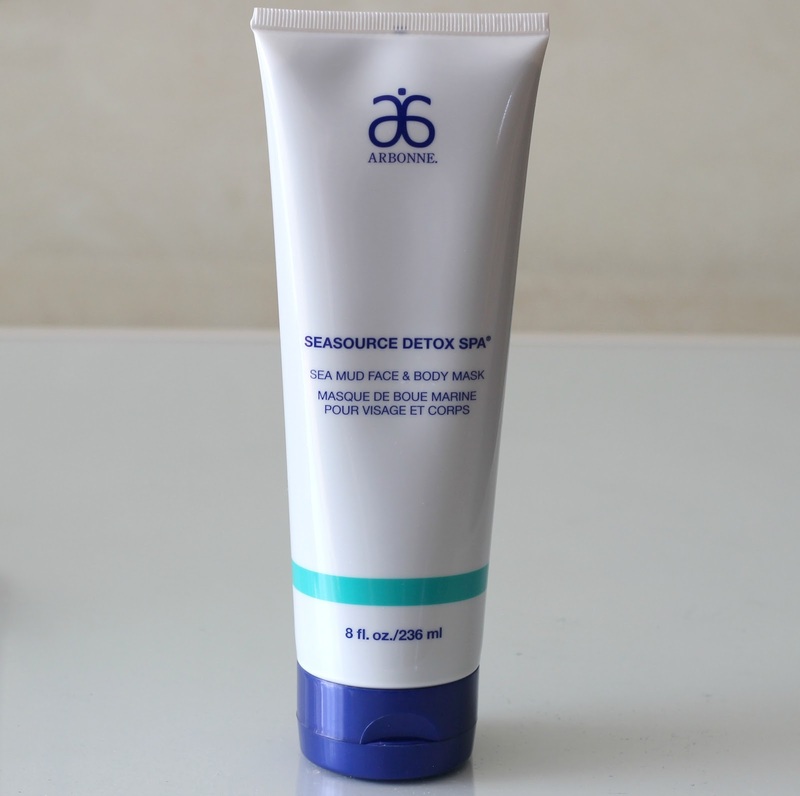 I was recently introduced to the Arbonne skin care line and received a handful of items to try from their various collections, namely the Arbonne Rejuvenating Cream*, Seasource Detox Spa Sea Mud Face and Body Mask* and RE9 Advanced Set*. In case you didn't know, their line is certified vegan and cruelty free, and void of known skin aggressors such as talc, phtalates, synthetic dyes and mineral oil - something I always appreciate. I've been giving these a go for the last few weeks and wanted to share how these have been working for me. Are they worthy of your hard earned mula? 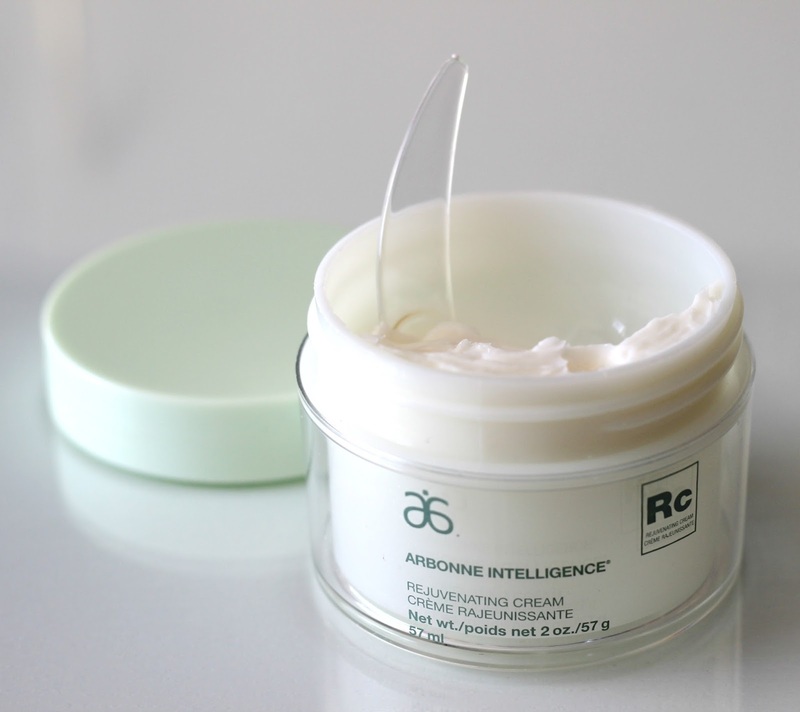 The Arbonne Rejuvenating Cream (US $40) was not at all what I expected. In fact, it is probably the thickest cream I have ever come across! So much so, that the texture is what makes me not be a huge fan of this product for my face. The box comes with a spatula, but despite using it, I would always end up scooping up too much and feeling like I added an extra pound to my face. However, it is also marketed as a body cream, and for that I have gotten good use out of it, even though it takes a while to absorb. It is packed with amazing plant ingredients such as aloe juice and various oils and extracts including sunflower, castor, bergamot, clary, alfalfa and chicory root. I wanted to note that packaging-wise, this product can be deceiving - there is only 2 oz. or 57 g of product and the jar creates the illusion that you get a decent amount because the bottom half is raised. Hence, for the price and the amount you get, there are definitely products that will give you more bang for your buck and still provide amazing skin benefits. The Seasource Detox Spa Seas Mud Face and Body Mask (US $57) has been the most interesting to try out. Formulated with bentonite clay, which is packed with minerals, and plant extracts that give it a green tint, this mask is great to help withdraw toxins lodged deep inside your pores. I am a huge fan of clay masks (you can read more about how I make my own DIY French Green Clay Mask) because I can notice a difference right after washing them off. This one is a bit more uncomfortable because it both cools and tingles, yet it doesn't cause irritation or redness. I leave it on my face for 10-15 minutes and on my body for about 20 minutes or until it has completely dried before rinsing off, and do this once a week. You get a hefty amount so I see this lasting me for a while. Lastly, I've been sampling the RE9 Advanced Set (US $395, full size line) which contains six products: their Smoothing Facial Cleanser, Regenerating Toner, Intensive Renewal Cream, Corrective Eye Crème, Restorative Day Crème with SPF 20, Extra Moisture Restorative Day Crème with SPF 20 and Night Repair Crème. This anti-aging kit is said to improve skin firmness and reduce the appearance of fines lines and wrinkles. This line hasn't been anything out of the ordinary as it does a decent job at cleansing, toning and moisturizing my face. Since I am still not at the stage where I have visible signs of aging, I cannot vouch for it helping to reduce them. Since the trial set is travel-friendly, I'll most likely be saving what remains for my next vacation to save on space in my beauty bag. Overall, I wouldn't say these are must-have products, and for the price there are better options out there. 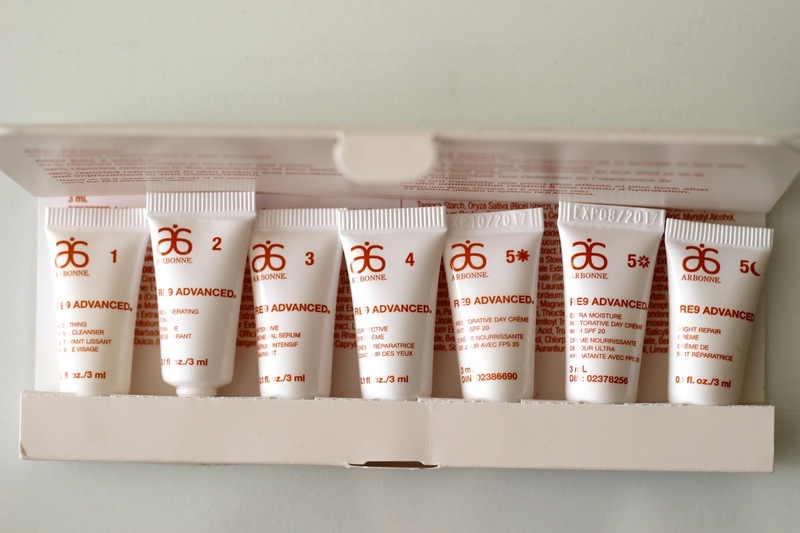 Have you heard of Arbonne? Are you a fan? I have heard of them as a friend is a rep. I'd love to support her but the price is a bit prohibitive. What would say are good alternatives to these? The Freeman Face Masks (available at Walmart) or even a DIY green clay mask are great alternatives I have previously shared. If you are in Canada, Druide has some really amazing skin care products too.